Celebrate with Blue Velvet Cupcakes! 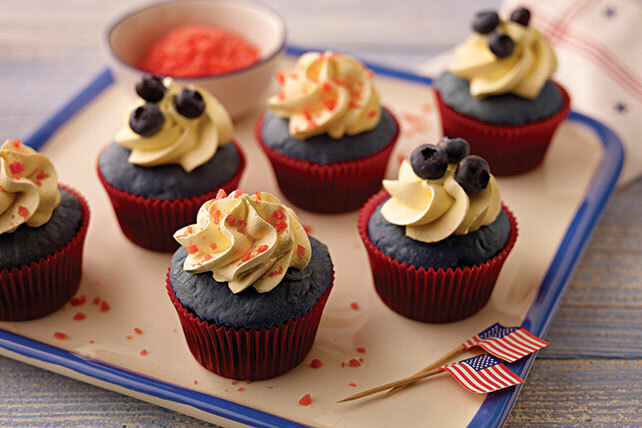 Topped with strawberry popping candy, whipped topping and blueberries, Blue Velvet Cupcakes are certainly patriotic. Prepare cake batter as directed on package. Add dry pudding mix, cocoa powder and food colors; mix well. Spoon into 24 paper-lined muffin cups. Bake 18 to 21 min. or until toothpick inserted in centers comes out clean. Cool cupcakes in pans 10 min. Remove from pans to wire racks; cool completely. Spoon frosting into medium bowl. Add COOL WHIP; whisk until blended. Pipe or spread onto cupcakes. Garnish 12 cupcakes with blueberries and remaining cupcakes with candy pieces. Fit pastry bag with desired decorating tip. Spoon enough COOL WHIP mixture into prepared bag to fill about halfway. Use to pipe COOL WHIP mixture onto cupcakes, refilling bag with remaining COOL WHIP mixture if necessary. Or if you don't have a pastry bag, you can use a resealable plastic bag instead. Spoon COOL WHIP mixture into bag, then cut piece off one bottom corner of bag before using to frost cupcakes.